He was born in Askas village,Nicosia. He studied the art of pottery at the Technical School in Famagusta taught by Andreas Poaros, teacher of pottery. Since then, he is working as a professional potter starting from Famagusta, Nicosia and now in Paralimni. He cooperated and collaborated with artists in various artistic creations. 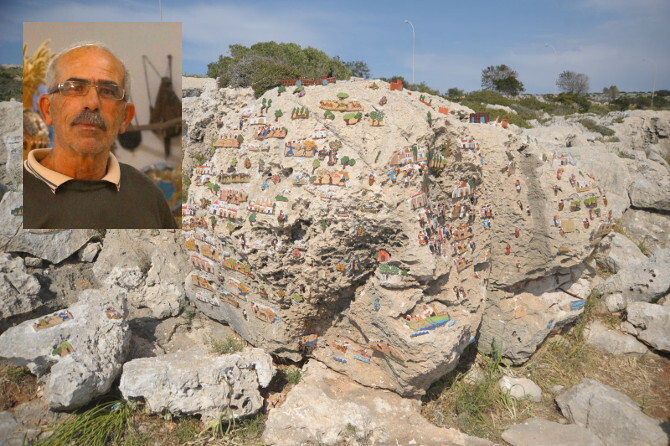 Also he affords services of his art to the municipalities of the Famagusta district, and he represents the Cypriot pottery in several missions of these municipalities abroad.He participates in various exhibitions of ceramic in Cyprus and abroad. His creations are adoring private collections, museums as well monumental creations in Cyprus and abroad. Title of the project:"The rock & its story"
Concept: The "Rock" symbolizes traditional life in Cyprus: its beautiful beaches, castles, monasteries, small mountain churches and traditional houses with their courtyards. Traditional activities including dancing, weddings, baptisms and funerals. Occupations like fishermen, agricultural workers, shepherds. Dairy farmers, halloumi makers and herdsmen using donkeys for transportation, etc. The ceramic figures and tiles used on the sculpture were made by the above creators at Askotis Pottery in Paralimni.